Air purifiers can help snoring triggered by allergies and pollution. Poor quality air can irritate our upper airways, leading to stuffy and inflamed noses and throats. Air purifiers filter out the harmful particles that bring on these symptoms and can massively reduce snoring as a result. You may think that your home has much cleaner air than outside, but there are some studies that suggest that indoor air is 2 to 5 times more polluted than air outside. Who can benefit from an air purifier? Air purifiers use internal fans to pull in the air and the harmful particles it contains. Once drawn inside the device, the particles are either trapped in a filter or are treated to stick to surfaces as opposed to floating around in the air. Size – can it be moved from room to room? There are air purifiers that sit on desks and there are those that are the size of desks. If you want to move it around with you from room to room, consider a small one that can be easily picked up and placed anywhere. True HEPA filter (highly recommended) – to be considered a true HEPA (high efficiency particulate air) filter, it must meet standards set by the US Environmental Department. These filters eliminate 99.97% of particles 0.3 microns or bigger. That means for every 10,000 particles that hit the filter, only 3 get through! HEPA-type filter (recommended cheaper alternative) – the HEPA-type filter works in the same way but less efficiently, eliminating 99% of particles 2 micron or bigger. Generally, this will still filter out pollen and dust mites but will not trap smoke particles. Activated carbon filter (highly recommended) – these filters use tiny pores between carbon atoms to trap harmful particles that pass through. Ionizing/UV filter (proceed with caution) – these types of air purifier make passing particles more reactive so that they stick to surfaces instead of floating in the air. Unfortunately, this can produce harmful by-products like ozone. If you do choose an air purifier that uses this technology, make sure the manufacturer states that the quantity of ozone produced is negligible and well within regulatory limits. If an air purifier produces ozone, this is something to be wary of and it is a good idea to look into the technical specifications. Some air purifiers use UV-C light to charge particles, getting them to stick to surfaces as opposed to floating around in the air. Unfortunately, this also charges the oxygen in the air (O2) causing the formation of ozone (O3). Whilst ozone is useful high up in the atmosphere where it protects us from harmful UV radiation, it can be dangerous if inhaled. Ozone is unstable and can react with the cells in our respiratory tracts. Different filters require different treatment to keep them working. Standard large particle filters can often be removed and washed for reuse. Many finer filters like the HEPA filters will require replacement after a period of use. How often you need to replace them depends on your use of the air purifier. The default that many makers state is to replace the filters every six months to ensure the unit still functions well. However, this will vary depending on your level of use. Some air purifiers come with a very useful indicator that alerts you when your HEPA filter needs replacing. When assessing the cost effectiveness of an air purifier, consider the price of replacement filters as they vary from brand to brand. Noise, or lack thereof, is particularly important when looking for an effective air purifier, especially if you plan to run it at night. Most air purifiers have different speed settings, with the lowest settings being noticeably quieter than the highest. If you plan to use the unit at night, make sure to get one with a very quiet low speed, and run the high-speed setting before you go to sleep to prepare the room. Bigger units at low speeds can be just as effective as smaller ones at high speeds, but much quieter. However, there are some portable air purifiers available that are still very effective at low speeds, such as our pick. Oscillating movements – by rotating, the purifier can take in air from multiple angles. Timers – very useful if you want to program the device to work automatically whilst you are out of the house. Air quality sensors – these air purifiers are smart enough to gauge the air quality and automatically start if it dips below a certain point. Smart units – link your air purifier to your smart phone, allowing remote operation and the ability to see the quality of the air in your home. 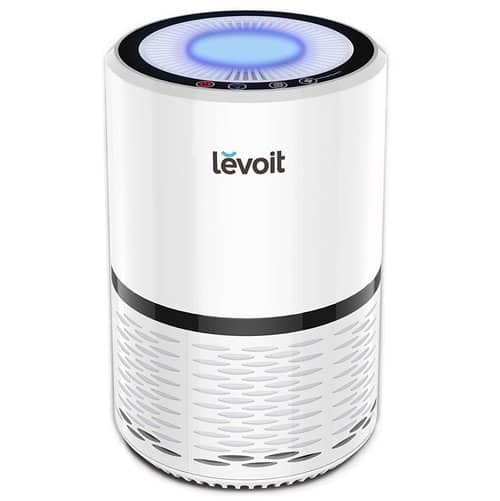 Levoit’s compact air purifier boasts three stages of filtration. This effective system meets the US Department of Energy’s standards by filtering out 99.97% of particles 0.3 microns or bigger (for some perspective, the thinnest human hairs are 57 times wider than this). Fine preliminary filter – this neutralizes bacteria, pet dander, mold and fungal spores. True HEPA filter – traps dust mites, large pollutant particles and pollen. Activated carbon filter – this captures odors and fine particles like those in cigarette smoke. This air purifier doesn’t need to oscillate as it is already facing all possible angles. Its rounded shape means it doesn’t just take in air from one place but instead attracts air all around, cleaning the room more efficiently. Just over a foot tall and weighing a little over six pounds, this air purifier can be moved from room to room with ease and placed on tables and desks. 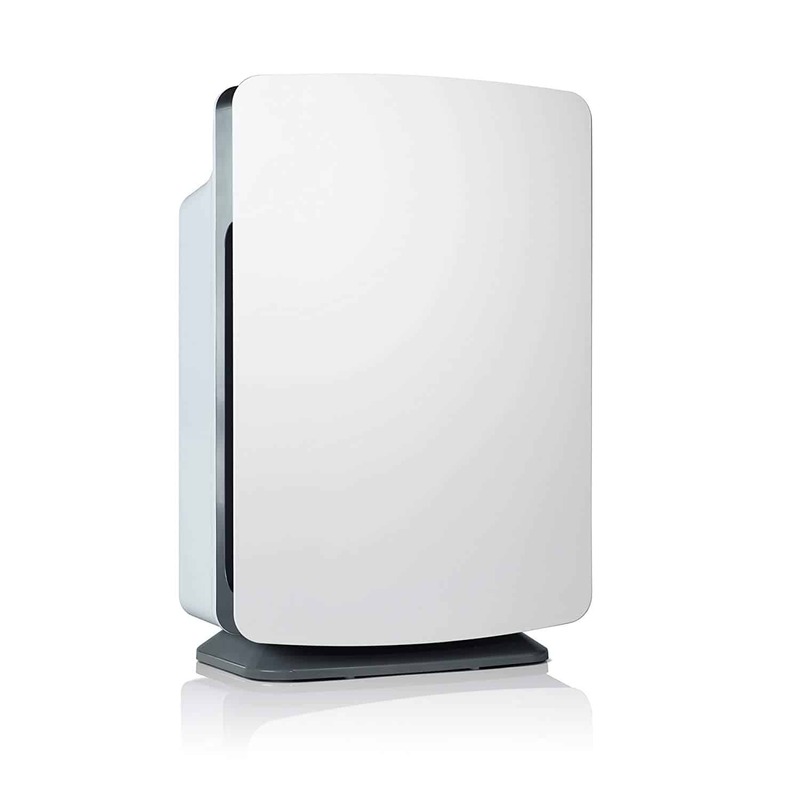 The Levoit Compact HEPA Air Purifier also has three speed settings, an optional night light and is very easy to use. Auto mode – laser sensors detect the level of pollution in the air as the unit adjusts accordingly. Customizable appearance – there are fourteen designer panel options that allow you to tailor the design to suit your home. Quiet and powerful – uses pink noise to eliminate high-frequency sounds. Energy efficient – this makes the unit cheap to run. Filtration options – of the four filters, one is an ionizer which can produce a negligible amount of ozone. This feature can be turned on and off as you wish. SnoreLab only endorses products that we have tested and verified give great results for our users. We earn a small commission on purchase made through our app and website which support the app’s development at no extra cost to you.